The easiest game to do this with is Portal 1 and 2. Levels often do not follow any real world structure. Cleverly, the designers introduced the idea of a test chamber to us, thus side stepping the need to justify why platforms move or why a doorway is placed 100 feet up with seemingly no way to reach it. The Portal games are therefore almost pure gameplay with a loose story wrapped around them and it serves as a good model to compare other Valve levels to. In a single player game, in order to put the player through some heavy duty action and test their control skills, it’s necessary to create dramatic spaces for the player to move through, over, under and around. The original Half-Life got around the issue of unlikely architecture with the concept of Black Mesa. An endless industrial labyrinth carved into a mountain. This allowed them to create epic spaces, endless drops for the player to teeter over, and conquer jumping puzzles within. Then later Xen alien architecture gave the level designers free reign to build whatever structures they like. In Half-Life 2 most of the action takes place in real world locations (with the exception of the Citadel) and it’s these kind of environments that require a closer look. I’ve added notes to the image below on the important level design aspects. This should provide a good idea as to the sorts of techniques that you should be on the look out for. 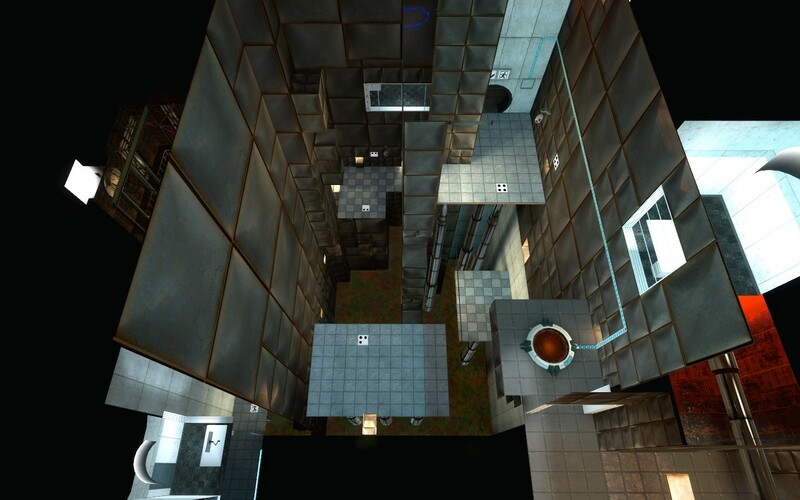 Half Life 2 level design elements – can you spot any more? Multiplayer versus games tend to have simpler, less dramatic settings. When you’re moving quickly and trying to hone your aim and trigger responses, the last thing you want to worry about is falling off a 100 foot drop. That gets old, very fast. 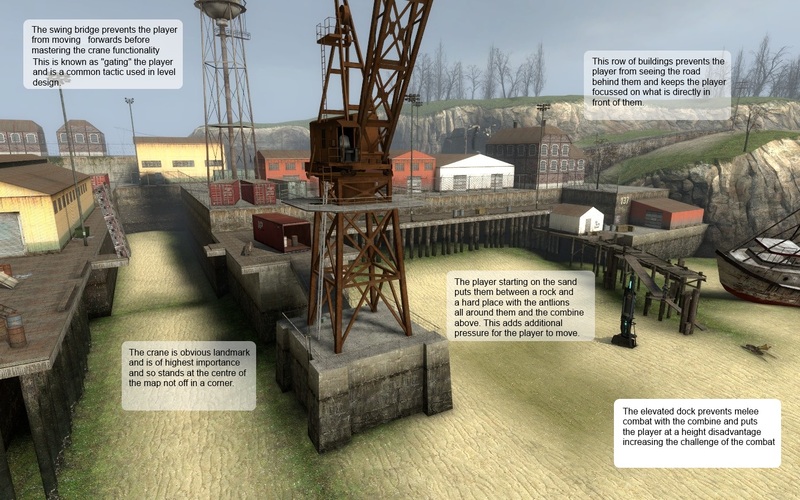 Pretty much every object in a map in Team Fortress 2, Counter-Strike and Day of Defeat is placed there to block or allow sight lines (or as scenery if outside the playing field). 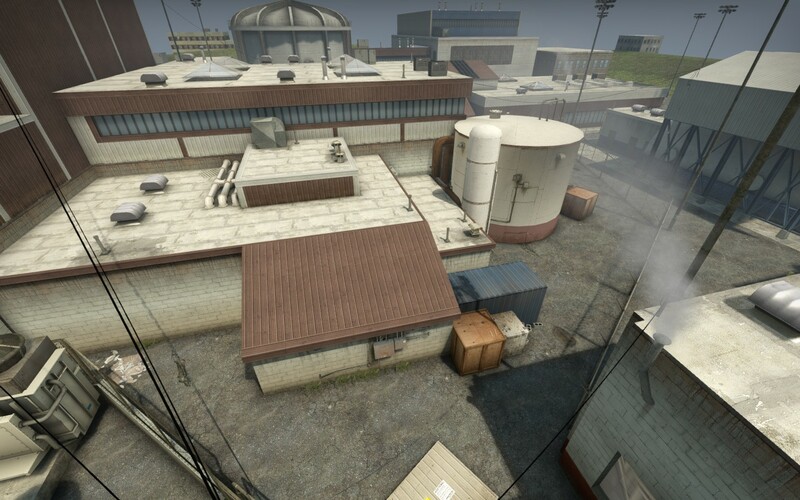 Good multiplayer maps are play-tested and tweaked many times to lock down exploits that players have found and to give each team as equal a chance as possible. 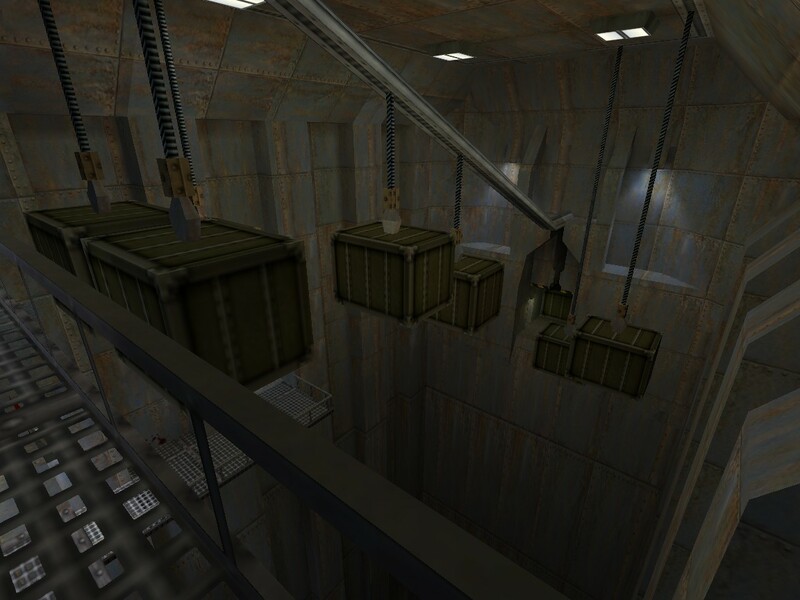 The choke points in de_nuke for example are perfectly created by the positioning of the metal crates on the outside and the doorways on the inside. Once these angles are established, all the mapper needs to do is texture the surfaces in a plausible way for the setting and bingo, the player just accepts them as part of the scenery. 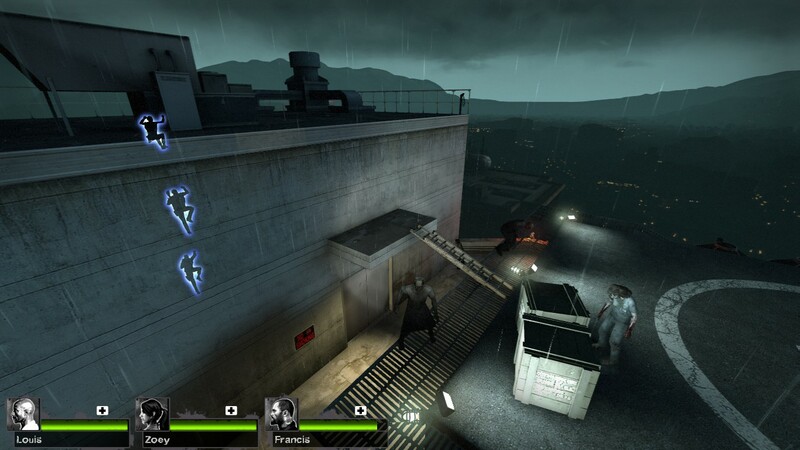 Left 4 Dead’s architecture is designed around the need for players to explore through areas and then hold them in position for a panic event. The game’s director engine (which decides where to spawn the infected) needs lots of small nooks and crannies to ensure that there is always a place where one of the players can’t see. So we find lots of corridors with off-shooting rooms (bathrooms, offices, hotel rooms). 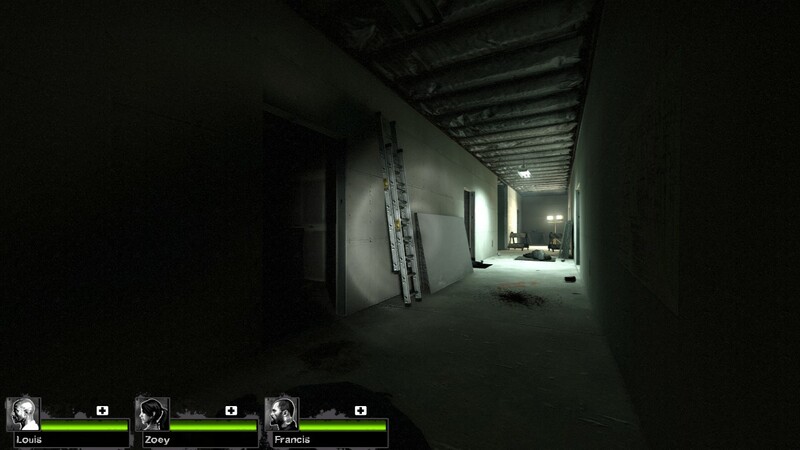 Left 4 Dead’s regular corridor with off-shooting rooms layout. Perfect for regular infected spawning. The panic event areas open this gameplay up to allow the players a sweeping view of the incoming hoard as they try and keep them back as they wait until they can progress. This kind of design isn’t by accident. It ensures the team stay together. Triggering a panic event when you’re alone is a very dumb idea and players know they stand more chance of survival waiting for the team. Also look for sneaky points of no return in Left 4 Dead and Half-Life 2. This also keeps players together and pushes players forward preventing them from going too far back in the level. Each section of a level, between points of no return, can almost be seen as a mini level unto itself with the player only taking the weapons they’ve collected with them. A point of no return in No Mercy. Once you drop off this roof there’s no way back! This video – https://www.youtube.com/watch?v=lgAiTqK6Nk0 – shows some of the level designs techniques very nicely.